A court has approved the release from prison of the man who shot Pope John Paul II in 1981, saying he completed his sentence for crimes he committed in Turkey, the semiofficial Anatolia news agency reported Sunday. Pope John Paul II was hit with three bullets: one in his stomach, another in his right arm and a third in his left hand. The attempt on the Pope's life occurred as he rode across Saint Peter's Square in an open car to hold a general audience with a crowd of 20,000 people. 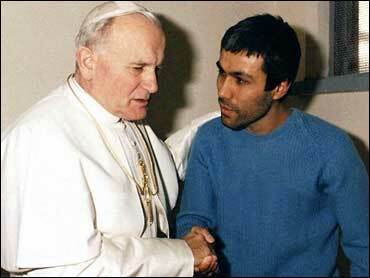 The Pope met with Agca and publicly forgave him 2 years later in 1983. "We did not hear it," Fatma Agca told the AP from family home in the southeastern city of Malatya. She refused to comment. An Istanbul court ruled in 2004 that Agca should only serve the longest sentence, his conviction for killing Ipekci. That 10-year sentence was changed twice because of new Turkish laws. Yildirim had pressed for Agca's early release in 2004, calculating that he could be released as early as December 2005 under new laws. The court did not respond.